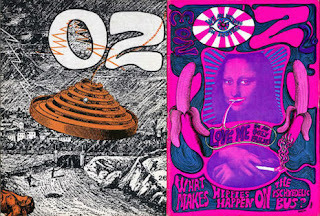 University of Wollongong is featuring every single page of OZ, the influential psychedelic underground newspaper published in London between 1967 and 1973 after several years of an Australian version. The newspaper featured an impressive roster of contributors, including Germaine Greer, Lillian Roxon, Barney Bubbles, David Widgery, Clive James, Edward de Bono, Richard Meltzer, Clay Wilson, Colin MacInnes, Anthony Haden-Guest, and Raymond Durgnat. Interview subjects included Pete Townshend, Timothy Leary, Jimmy Page, and Andy Warhol.